The Gold Room is moderately spacious with a queen bed. Though sharing a full bath with room 2, the arrangement is private to the two rooms, and a compensation may be the very large and old eagle talon-footed tub with shower. Exclusive to this room is an adjoining garden spa room which opens onto its own patio. The Peach Room, though of a different decor, is similar to the Gold Room. The full bath is shared with room 1. This bedroom is furnished and decorated with heirlooms of Joy's maternal grandmother. 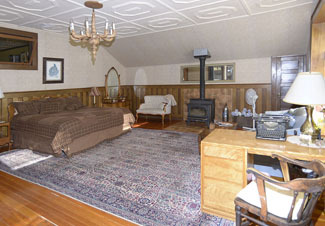 The Blue Room has a queen bed, a queen hide-a-bed and a private full bath. It is moderately spacious and large east and south windows make this room bright and cheerful all day and in all seasons. Three bedrooms and a small kitchen for the use of the guests are located on the second floor (up a single flight of stairs). The kitchen contains a refrigerator, microwave, and an ironing board and iron. The Pink Room has twin beds in trundle fashion. It shares a full bathroom with room 6 (see below). It is our smallest room but made cozy with family pictures and decor. 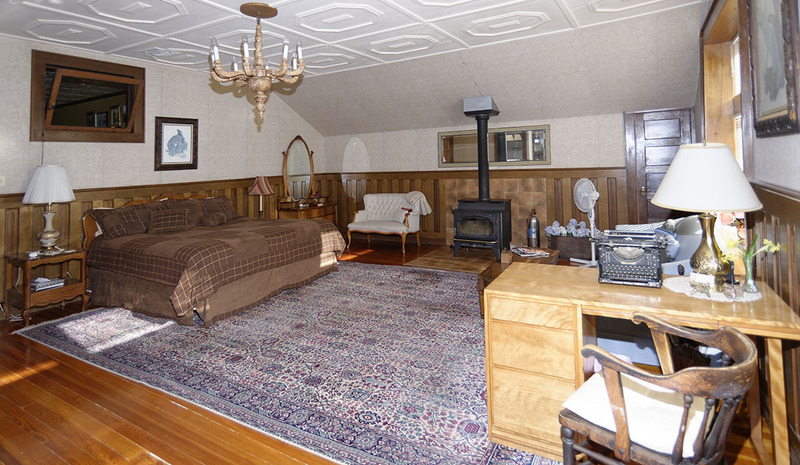 The Beige Room has a king bed and a most curious antique 3/4 Murphy bed. The room is of a quiet and masculine character, achieved partly by intricate wainscoting in concert with a wood tone decor. It is of stately proportions common to the grand old homes of yesterday. A private bath with shower only accompanies this room. 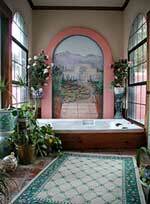 The Master Bedroom, has a queen bed and shares the full bath with the Pink Room. Like the Beige room in size but palatial in appointments. A description by us will not do justice to its beauty. The apartment is located above a carriage house behind the main building. It has a large deck overlooking Mexico to the South. Complete with a queen bed, twin hide-a-bed, 3/4 bath, lounge area, TV, VCR, and a fully equipped kitchen, the apartment also features WiFi, evaporative cooling and a heater for those cool high-mountain nights. All of our rates include our full cooked to order breakfast served in our dining room. WiFi access is available to all rooms. Guests who prefer ethernet (hardwired) hookup can attach to our router; hardwire connections are not available to the individual rooms. Maximum number of adults/room is 3. State and local taxes are added to all charges. Children older than six months are charged as an adult. Check out time is no later than 10:30 AM. No smoking is allowed inside any of the rooms or inside the house itself. We heartily encourage day visitor tours of the home and grounds. The pleasure and inspiration they usually elicit pleases us more than anything else, and we therefore think any sense of obligation by the visitor fairly requited. We are not a business first, but last, believing many other things more important as will be made evident by your visit and tour. Please, no tips or donations; happily and fortunately, we are doing just fine.